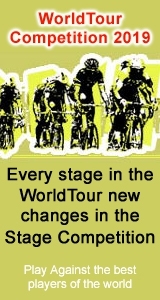 Tour de Suisse - CyclingFever - The International Cycling Social Network - Get the Cycling fever! Last chance for the riders to get into shape for the Tour de France, only a few weeks away. But the Tour de Suisse is a great race in its own right. Situated between France, Italy, Austria and Germany and smack in the middle of the Alp mountain range, it guarantees spectacle from beginning to end. Like the Dauphiné Libéré, this Tour of Switzerland has all the right ingredients. Usually starting off with a prologue or finishing off with a difficult time trail, and in between many steep mountain stages and even some flat sprint stages. Put that together with an immaculate organisation and you’ve got a fabulous race! Historically, the Tour de Suisse has been around from 1933. Not a Swiss but an Austrian rider, by the name of Max Bulla, gets the first win here. Like many other races in those days, this race also had its share of problems with the Second World War. Although Switzerland was in fact the only neutral European country during the war, the organisation couldn’t organise the 1940 edition. They failed to get many entries into the 1941 and ’42 editions, but the race was still held. By 1943 Switzerland also felt the pressure of the German instigated war and declined to organise any race until peace was reached between Germany and the “European Allies” in 1945. Since 1946, the Tour de Suisse has been on the race calendar every year and would produce many prominent winners. The only thing that really stood out during the 1942 race was a peek at a new Swiss talent, Ferdinand Kübler. He was unfortunate that a great Italian “owned” that post-war period as well. Gino Bartali and “Ferdi” Kübler fought many battles on Italian and Swiss soil those days. Another great Swiss champion, Hugo Koblet, joined the battle a little later. Both Swiss cyclists won the Tour de Suisse three times, while Bartali managed to get wins in 1946 and ’47. These three riders dominated the post-war decade, but did see the introduction of an Italian rider by the name of Pasquale Fornara. He still is the undisputed champion with four victories during the Fifties. This race’s ties to the Tour de France are not as tight as the Dauphiné’s. Still, a number of champions managed to win the French race as well as this one. Kübler, Bartali and Koblet all won both races, but never in the same year. The only two that did manage a win in the same season are the greatest names imaginable in professional cycling. 1974 saw an invincible Eddy Merckx win in Switzerland and France. The same goes for the 2001 winner. Lance Armstrong, already a legend in these times, was the only one to copy that win by Merckx and get his name on the top of the leaderboard in the Tour de Suisse and Tour de France in the same year.